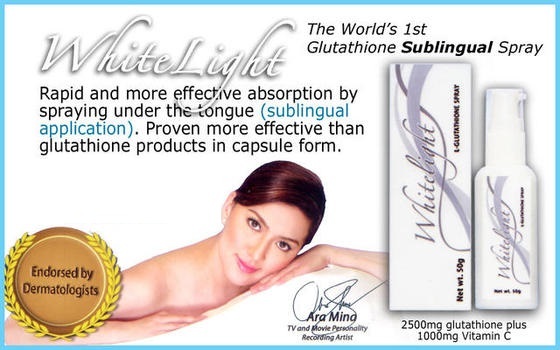 Whitelight Glutathione Sublingual Spray – Alliance in Motion Global Inc.
Whitelight Glutathione Sublingual Spray’s Glutathione as an antioxidant, helps liver to remove toxins from our body, promotes longevity, prevents cataracts and heart disease, is beneficial to a variety of conditions such as asthma (skin or lung), cancer, osteoarthritis, Parkinson’s Disease, immune suppression resulting from AIDS, hearing loss, male infertility and don’t forget the skin lightening side effect. Glutathione is a tripeptide (consisting of 3 amino acids joined by peptide bonds). It is a tripeptide composed of the amino acids glutamic acid, cysteine and glycine. It has shown positive preliminary results in several studies of glutathione’s ability to affect levels of reactive oxygen species, which may have implications in the reduction of cancer rates. Dietary glutathione is found in fres and frozen fruits and vegetables, fish and meat. Asparagus, avocado and walnuts are particularly rich dietary sources of glutathione.Antioxidants protect cells from reactive oxygen species such as free radicals and peroxides. Metabolically, glutathione plays a substantial role in the functioning of the body’s immune system. Its antioxidant property makes it vital to white blood cells (lymphocytes) as it allows them to reach their full potential during oxygen-requiring activity of the body’s immune response. “under the tongue” refers to a method of administering substances orally in such a way that the substance are rapidly and more effectively absorbed compared to capsules and tablets via the digestive tract. with the enzymes in saliva prior to entry into the bloodstream. See the Best Results After 1 – 2 Months of Continuous use, depending on your skin color. * Glutathione for children is PROBABLY safe, BUT it SHOULD be under the supervision of a medical/healthcare provider. * Glutathione for pregnant and breastfeeding women is still unknown for its safety. Consult first a medical/healthcare for proper instructions if the condition permits. No known reports if taken in prolonged use. Alcohol and Acetaminophen may decrease the level of Glutathione and its antioxidant activity. Why is vitamin C needed when taking glutathione? Vitamin C will keep Glutathione in its absorbable or usable and reduced (L-Glutathione)form. It also has derivatives of whitening properties which will work synergistically and beautifully with glutathione.